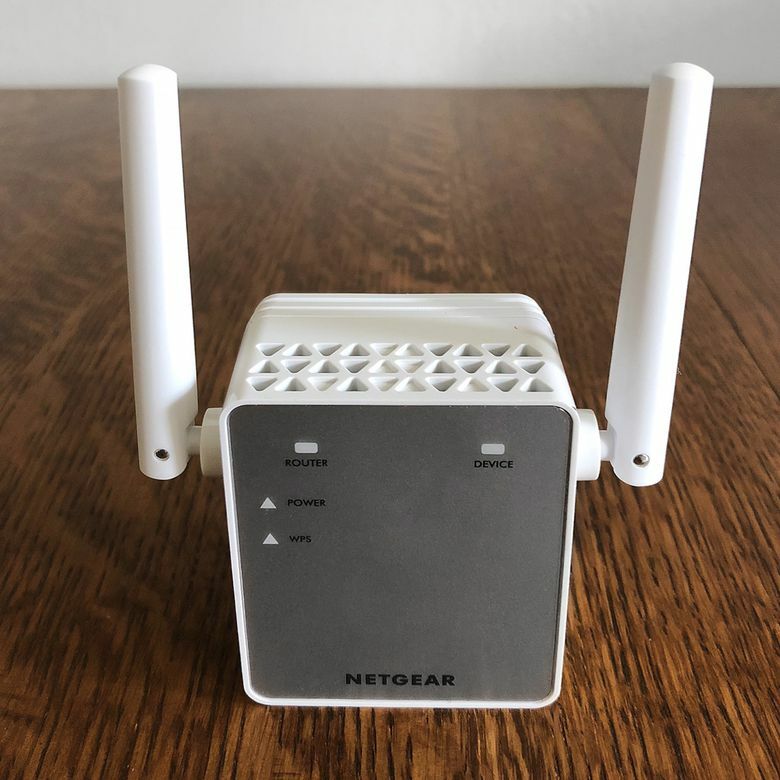 The Netgear EX3700 Wi-Fi Range Extender (AC750) is a compact powerline adapter that offers decent network connectivity, but has somewhat barebones options and strange design decisions. Sometimes, your wireless network just needs a bit of a push. When it comes to dealing with poor connectivity in your apartment or home, wireless range extenders like the Netgear EX3700 (AC75) are an effective option to ensure your internet reaches everywhere you want it to. Even better, it probably won’t cost you as much as shelling out for a premium mesh router. The Netgear EX3700 Wi-Fi Range Extender (AC750) is a viable choice for those looking to save some serious cash, as it offers a decent range boost at a low price, though it does cut a few corners in terms of design and sturdiness. We spent some time testing the EX3700 to in our apartment to evaluate its design, network performance and connectivity, and software. The Netgear EX3700 Wi-Fi Range Extender (AC750) is a serviceable device that's perfect for anyone on a budget. Unlike other competitors' svelte designs, the EX3700 has a bit of a bulky body and casing. It resembles a cube-like AC power adapter with two antennas on either side. The front is a matte silver, with Router, Device, Power, and WPS indicator lights facing towards you. The left side of the EX3700 has a factory reset button, surrounded by triangular air vents, and WPS and On/Off buttons. They're incredibly easy to push, to the point you may do so by accident when plugging the adapter into the wall. The antenna placement is some of the worst we've seen on power line devices. Whether flipped all the way up or hanging on either side of the device, they don't always stay put when arranged just so and don't feel particularly sturdy. There's one Ethernet port on the right side, which ends up being completely covered by one antenna if you leave it pointing toward the floor. Placing it on the bottom of the extender would have been a much more viable design choice. The design’s only real saving grace is that it can be plugged into a wall outlet without blocking the other outlet. The browser-based setup procedure is simple and efficient. There's no software to install, and the web-centric device management is great for users who want to keep things easy. There are, however, plenty of options for power users to log in and change up should they choose to after setting up a Netgear account, and it’s easy to check at any time after initial setup. Setting the extender up via laptop is a very simple process. To do this, you need to first plug the extender into an available outlet. It needs to be in the same room as your router, but only during initial setup. You can move it later. Once the indicator light for Power has turned green, you can begin setup. First, you'll need to ensure you're logged into the same wireless network you'll be using the extender for (that’s your home Wi-Fi network). Then you'll need to head to the "www.mywifiext.net" setup page and hit "New Extender Setup.” The Netgear Genie will then walk you through creating an account, which is an extraneous step that other powerline adapters don't always require, so if you're looking for a quicker router and want to skip all of this, you may want to opt for WPS setup instead. When you've entered all the required information, the Netgear Genie setup will inquire whether you want to set up your device as a range extender or access point. Selecting the range extender option will bring up a range of different networks you can connect to, where you'll need to select the one you're operating on. After logging in with your username and password, the Netgear Genie will connect to the network and begin repeating your wireless signal. There's an option to rename your extended networks if you choose to for both the 2.4GHz and 5GHz signals. It's all extremely straightforward. After setting up the extender in the bedroom, we experienced a strong and reliable wireless signal. After you get through the initial setup, you can log into your Netgear account and tweak a wide variety of settings from there, which is quite surprising for a budget extender. If you're new to networking in this respect, you won't want to touch any of these settings, but the fact that they're there and easy to adjust is a boon for more advanced users. If the router you're using supports Wi-Fi Protected Setup (WPS) you can simply press the WPS button on the router and then the one on your extender. Wait a few minutes, as the light will initially turn amber, and then green. When it’s solid green, you should have connectivity. Not all routers may work with this method (in some cases it’s disabled by default unless you’ve gone into ipconfig,) but it’s a nice, simple option to have. According to Netgear, this particular range extender can handle throughput at 433Mbps for its 5GHz band, and up to 300Mbps on the 2.4GHz band. In total, the extender can theoretically hit 750Mbps, provided your internet provider can support it. When putting the EX3700 through its paces, several devices were connected simultaneously to the same network: a Google Nexus 6 phone, iPhone X, iPad Pro, Nintendo Switch, and PlayStation 4. After setting up the extender in the bedroom, we experienced a strong and reliable wireless signal. Plugging in with the Ethernet port is the best option for devices like TVs and game consoles, though we didn’t have a problem using them on Wi-Fi either. At 10 feet to around 80 feet away from the router in our 2,100 square foot home, the signal rarely, if ever, wavered. There were a few drops here and there, but they only happened when large amounts of data were passing through, such as watching movies via Netflix or connecting the iPad to download updates for a particularly large mobile game. Beyond 80 feet, signal strength degraded. 80 feet is a pretty mediocre range as far as an extender goes. It’ll work to eliminate a dead spot in your house or provide connectivity to a small room, but for a very large area you’re usually going to be better off with a mesh Wi-Fi setup. The EX3700 boasts a list price of just $46.99, though it usually goes for about ten to fifteen dollars cheaper than that. Netgear markets this particular model as part of its "Essentials Edition" line, and it's clear that the price gives you a tradeoff in terms of less polished design and materials as well as performance. Still, you're getting a product that does what it says for a pittance. If you have a smaller home, you shouldn't have to worry about too much drop-off. The Netgear EX3700 Wi-Fi Range Extender (AC750) is a viable choice for those looking to save some serious cash. The range of powerline wireless extenders on the market in this price range and form factor is quite large. There are several other options you could choose from like the Linksys N600 Pro Dual-Band Wi-Fi Range Extender which has a similar price, though a somewhat bulkier design. Another good option is the TP-Link AC750 Wi-Fi Extender. It offers the same speed as the EX3700, has a bottom-facing Ethernet port, and a much sleeker design that’s free of finicky antennas. Both are affordable options that can help bring Wi-Fi to dead spots in your home or apartment. The Netgear EX3700 Wi-Fi Range Extender (AC750) is a serviceable device that's perfect for anyone on a budget, but it's bereft of many of the bells and whistles its more expensive brethren bring on board. It’s more than enough to cover a dead zone or small room, but if you had a large space you want to get strong Wi-Fi connectivity to, you may want to consider more costly mesh router setups. Product Dimensions 5.63 x 3.9 x 7.01 in.